As a self-proclaimed master declutterer in all aspects of my life, I clapped my hands for today's challenge. 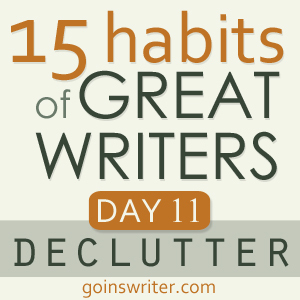 Day 11 in the Great Writers series is to declutter. Whether it be material items cluttering my life or people who are cluttering my positive energy, I make it my business to remove the clutter. It makes for a serene and joyful life. I tweeted a quote from the blog Marc and Angel Hacks Life: Subtract the wrong things. – When things aren’t adding up in your life, it’s time to start subtracting. Sometimes you must let go to grow. I have no qualms about removing items and people who occupy negative space in my life. Clean up your space. Spend some time (at least five minutes, but no more than 30) doing the following: clear off the desk, sharpen your pencils, put your files in order, take out the trash, wash the dishes, whatever. Do what you need to do to feel better about the place where you do your work. Cut your writing down to its purest essence. Turn a 500-word article into 250 words. If you’re brave, convert 1000 words into 300. Take away everything but exactly what you want to say. Eliminate weak, lazy words like “that” and “things” and anything you don’t absolutely need. Then say what you have to say and be done with it. I carry 2 books in my laptop bag: The Elements of Style by E.B. White and William Strunk Jr., and On Writing Well by William Zinsser. The reverence I hold for both books rivals my Bible. However, my daily references haven't prevented grammatical errors or typos on my tweets and blogs; nor diminished my use of weak, lazy words. (Hmmm, I'm sure the word "nor" could be added to the list.) Since my days as an English Literature student I've been taught to be mindful of overusing weak words in my writing. But I know some days I'm not as diligent. Number One on today's challenge is simple but Number Two needs to be tackled with a vengeance.